Every November, Sinterklaas (also known as Saint Nicholas) travels from his home in Spain to the Netherlands. Dutch tradition says Sinterklaas lives in Madrid and each year he arrives into the Netherlands via a different port. Travelling with him are his Zwarte Piet helpers who bring special treats and gifts for the children. 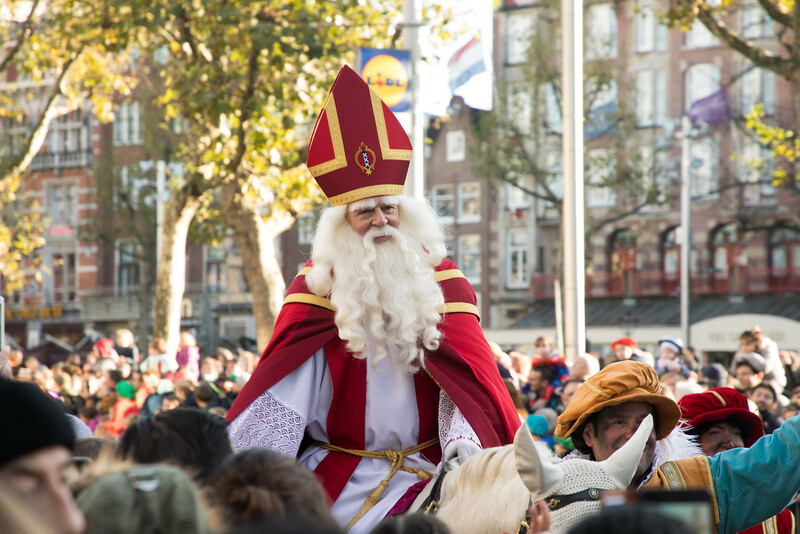 This major festive event includes a boat parade, followed by Sinterklaas riding his white horse, Amerigo through the streets of Amsterdam. His mischievous Piet helpers travel alongside, some on rollerblades, others abseiling walls. Last year, our arrival into Amsterdam from our Viking River Cruise coincided with the arrival of Sinterklaas. Not sure who was more excited – me or the loads of children lining the streets waving excitedly and collecting the sweets and candies that were being thrown into the crowd. Me probably- I have a very sweet tooth! Sinterklass is based on Saint Nicholas (270-343), a Greek bishop in Myra which is now part of modern-day Turkey. He looks remarkably similar to Santa Claus or Father Christmas with his long white beard and red attire!! Apparently, he now resides in Madrid with his helpers. They say he lives in Spain because, in 1087, half of Saint Nicholas’ relics were sent to Bari, Italy which later became part of the Spanish Kingdom of Naples. European history can be so confusing! Another version is because mandarin oranges are traditional gifts at this time, therefore he must come from Spain. I like this version more! The Zwarte Piet helpers are there to assist Sinterklaas. The Zwarte Piet wear colourful 16th-century clothes, with a ruff lace collar and a large cap. They carry a bag laden with sweets and run around, hurling candy into the crowds for the children (and me!). This tradition supposedly originates from the story of Saint Nicholas rescuing three young girls from a life of prostitution by throwing coins through their window at nighttime to pay for their dowries! Traditionally, the Zwarte Piet would carry a chimney sweep’s broom made from willow branches which were used to spank naughty children. In some of the old songs about Sinterklaas, it mentions taking the naughty children back to Spain in a Zwarte Piet’s bag. 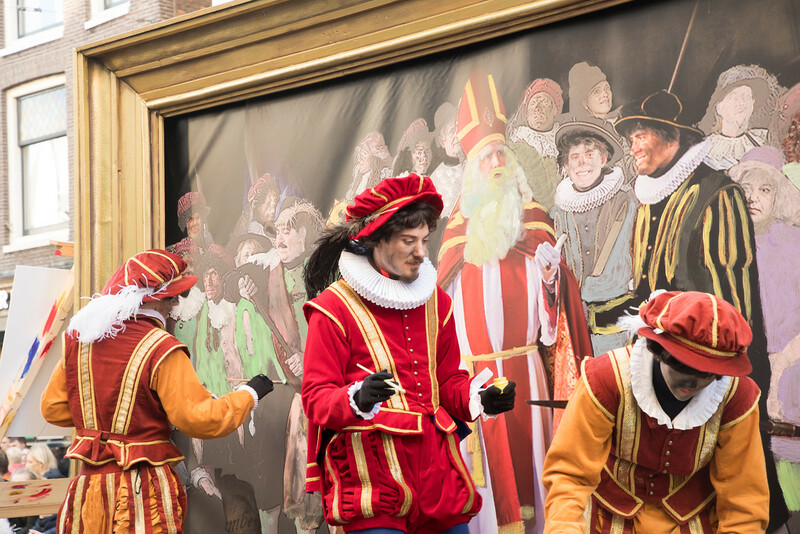 Over the years, new stories of the Zwarte Piet have been added, and today the helpers have developed from being rather unintelligent to a useful aide to the absent-minded Sinterklaas. These days with the arrival of Sinterklaas being televised, Sinterklaas has a Zwarte Piet for every function. 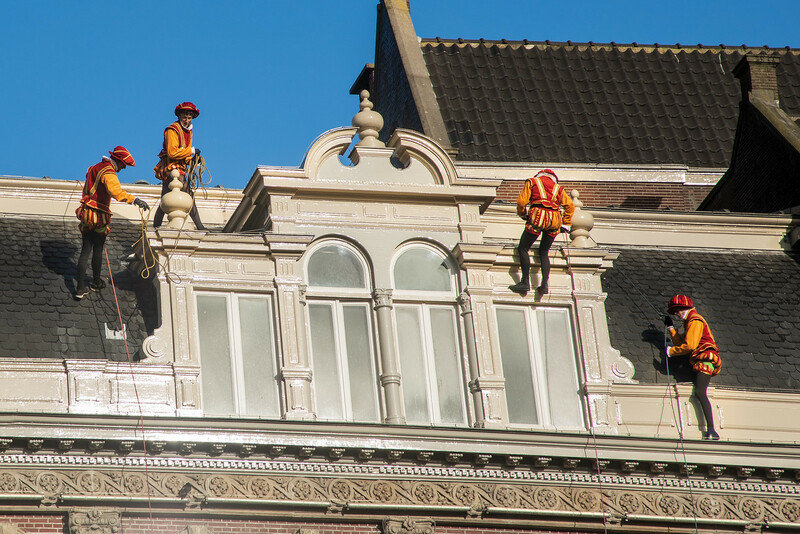 There is a head Piet (Hoofdpiet), a navigation Piet (Wegwijspiet) who drives the steamboat from Spain to the Netherlands, a gift-wrapping Piet (Pakjespiet) who wraps the presents, and our favourite, the acrobatic Piet to climb roofs, chimneys and abseil the buildings. Traditionally Zwart Piet is portrayed with a black face because he is a Moor from Spain. Nowadays, some people prefer to say that his face is smudged with soot because he has to climb down chimneys to deliver presents on behalf of Sinterklaas. 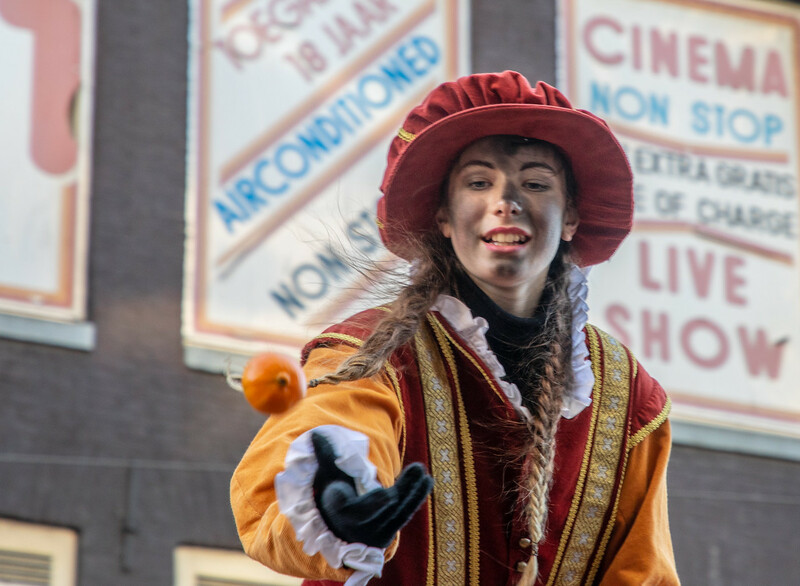 In past years, there have been protests and debates as to whether depicting the Zwarte Piet with a black face is racist. 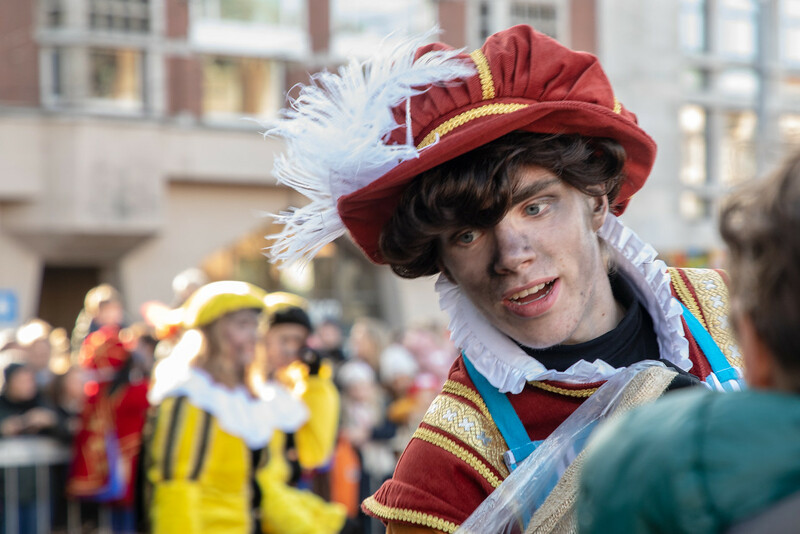 Today, many Dutch cities and TV channels only show the Zwarte Piet (Black Pete) characters with soot marks on the face rather than the full blackface – the so-called chimney Petes. The actual official holiday in the Netherlands is the fifth of December. This is the day when gifts are exchanged. Children sing songs to Sinterklaas as loudly as they can, until there’s a knock at the door. If they have been good kids, there will be a bag of goodies just outside the door! Have you seen this event? Tell us all about your experience in the comments below, we would love to hear about it! I spent travelled so many times to Amsterdam but never at this time of year to see Sinterklass or Black Pete. I don’t think it’s racist at all, as it refers to the soot from the chimneys, but that’s just me! Love the Spanish connection too. Enjoyed reading the Dutch tradition about Sinterklaas. Boat parade sounds fascinating and looks so amazingly colorful and fun. Its interesting how historical stories may have different versions such as Zwart Piet face color and then how the meaning is shaped in the modern times. Truly loved this informative and insightful sharing about this special celebration in Amsterdam. Great information. Wish to travel to Amsterdam some day. It’s a beautiful city, would love to spend more time there. I’ve never heard of the event. Very interesting read. Great photographs too btw … must have been great to be there. I visited Amsterdam more than 10 times but never during this time of year. I think people that protest against it and consider it racist are too sensitive. The black face is related to the soot from the chimneys, not someone’s skin color. Anyway, it seems like an interesting festival, one I would love to attend to. It was certainly fun to see. I’ve not been to Amsterdam during the holidays so I’ve never seen the Sinterklaas arrival. I like the fact that he lives in Madrid (rather than the North Pole!). His helpers are reminiscent of the elves. I don’t blame you for being excited like the children, what a well-timed stop! When I first saw the title for this I was preparing myself for Black Face, and I’m so glad the people of Amsterdam have gone a different route for Black Pete. You can still honor a tradition and be racially sensitive! Good to see. Wonderful photos though, such a fun looking day! I love reading such mythical stories. Saint Nicholas looks so similar to Santa Claus indeed. I loved the city of Amsterdam during my first visit and this just gives me a better understanding of the Dutch culture.Thanks for sharing this festival story. That looks like fun. They know how to make a bit of a show. In Finland, where I live the festivals are ridiculously boring. Oh wow! That’s something I’ve never heard of so far! A Spanish Santa who travels to Holland? Wow! That’s interesting! I like this origin of Black Pete as well. 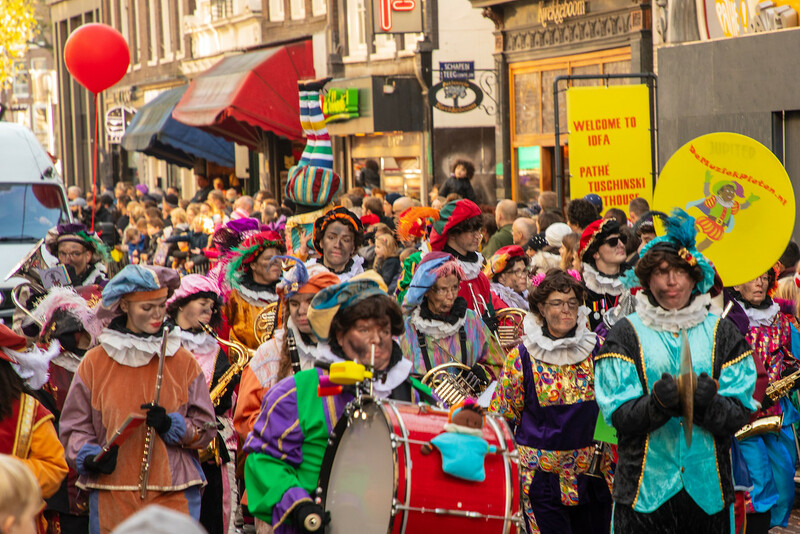 There is a very similar carnival in Belgium too called the Binche Carnival. Here too people dressed in a clown-like attire, throw oranges to gathered people! What a fun celebration! We use to have something similar in Romania too when I was a child. On December 5 Saint Nicholas would come at night and leave some small gifts for the children who have been good during the year. Each child had to put a pair of shoes next to the front door and in the morning go check what was left in them. This was not a time for big gifts, just some candy, or crayons, or a chocolate bar. If you were bad, you could expect to find a big stick in your shoes. We were all anxious to see if Saint Nicholas would know that we misbehaved that year. This looks like so much fun! I loved learning about this story and seeing your amazing photos. I’d love to get to Amsterdam and experience this in person someday! This festival is full of colors and vibrancy and I never knew of this Dutch festival held in November. 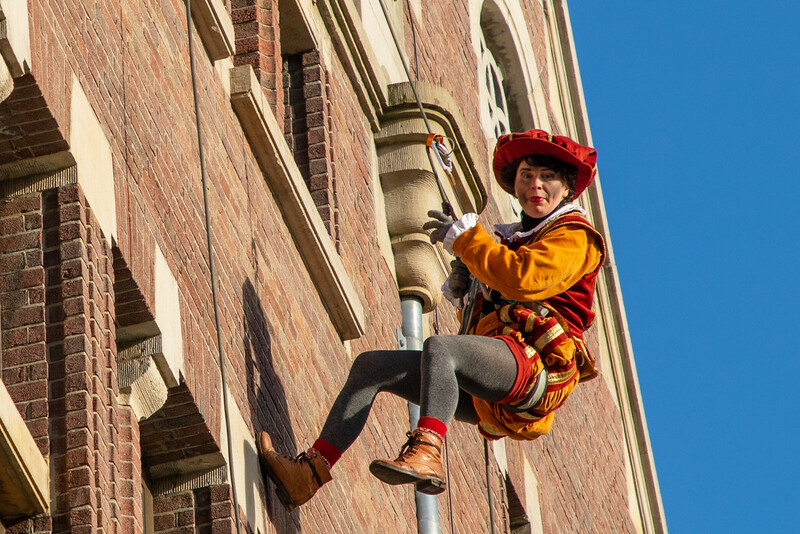 Zwarte Piet looks very funny as he is climbing beautiful buildings of Amsterdam and making the whole atmosphere very happy and interesting. I always love clothes from the 16th century with laces, frills & ruffles, therefore, seeing these characters in those styles is great. These are so cool. I love their costumes. This is already on my bucket list. Thanks for reminding me with such vivid photos! Great photographs! I love learning about the Christmas traditions in other countries. I’ll have to add it to bucket list.